Budget-accessory vendor Monoprice.com, known for its inexpensive cables and adapters, will be introducing a line of high-end LED displays with screen quality designed to compete with Apple’s $999 Cinema Display, a company representative told Macworld. The first model will be a 27-inch in-plane-switching (IPS) WQHD display with a 16:9 aspect ratio at 2560 by 1440 pixels. The company says the panel will offer a 1000:1 contrast ratio, maximum brightness of 380cd/m2, 6ms response time, 178-degree off-angle viewing (both horizontal and vertical), and a 72-percent color gamut—specifications that compare favorably to Apple’s display. The dual-link-DVI Monoprice display will ship with a tilt stand and VESA wall-mount capability; it will also include built-in speakers. 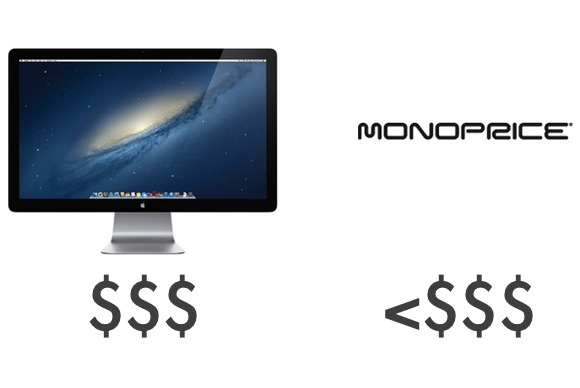 Unlike Apple’s aluminum offerings, Monoprice’s display will feature a glossy-black-plastic enclosure. The company has not yet announced final pricing or a specific ship date, but Monoprice says the display will be available sometime later this year and should be priced substantially lower than other similar-quality displays currently on the market.